Abruzzo is located in central Italy and offers the benefit of discovering a very unspoilt Region which stretches from the heart of the Apennines to the Adriatic Sea. Abruzzo with its many attractions has plenty to offer, such as the National Park of Abruzzo, the Park of Gran Sasso and the Laga Mountains, or that of Mount Majella, which protect the typical vegetable and animal species of the area, the presence of a stretching characteristic hillside area rich in vineyards and olive groves along with one of the highest densities of blue flag beaches have awarded Abruzzo with the official title of greenest region in Europe. Our mountains which are well-equipped for skiing and the beaches which range from white sandy shores in the north end to rocky pebbled beaches to the south all contribute to the advantages of this beautiful Region. 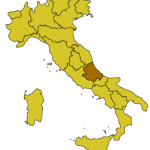 Abruzzo’s wealth with it many castles and medieval towns are a highlight of the Region and a further activity worthy of note is seaside and mountain tourism, which is of considerable importance to the economy of the region. Agriculture, involving small holdings, has succeeded in modernising and offering high-quality products amongst produce wine, cereals, sugar beet, potatoes, truffels, olives, vegetables, fruit and dairy products. Traditional products are saffron and liquorice. 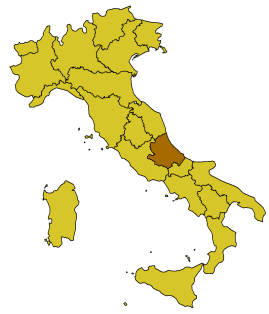 Most famous in the world is Abruzzo’s wine Montepulciano d’Abruzzo which earned a reputation as being one of the most widely exported DOC classed wine in Italy. Discover a little more on skiing resorts, beaches, transport, outdoor festivities and cuisine.